Fly fishing gear is invented and reinvented regularly. Some items fall flat, while others make an impression, offering technical and design improvements that result in even greater comfort and greater utility. Here’s a roundup of some recent candidates, many of which were featured at IFTD 2014. Lems are ultralight boots that can be worn year-round. 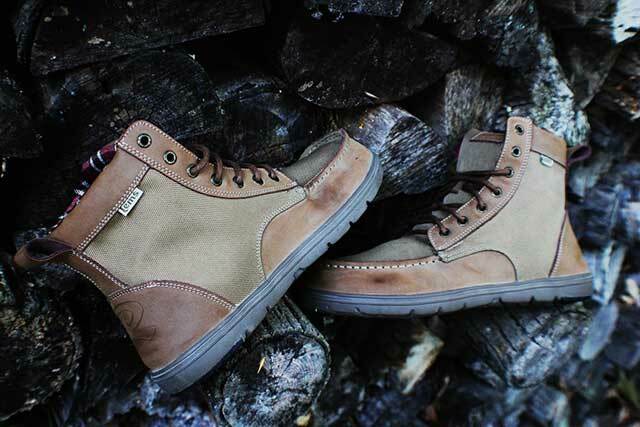 They feature hand-built lasts that offer comfort on a variety of terrains. In summer they can be worn to protect your ankles and lower shins from underbrush while hiking to a site, all the while keeping your feet cool and comfortable. If your agenda features colder days and colder waters and you’ve been wearing neoprene waders for the last 12 hours, look to Lems when comes time to peel off the waders. The soles have integrated micro-bumps to massage feet that have been trapped in wading boots for long periods. Lems will also keep your feet warm at the fishing cabin. Bonus: because they’re made with the lightest possible materials, they’re ultra-flexible, so they easily stow in a regular back pack. Boots that are built (and feel) like slippers – no brainer. Fishing in wet apparel is rough. Accompany that with some boat spray and a little boat speed and you’re cooling off at record pace. Simms has been keeping fishers warm and dry since day one, and all of their experience has gone into producing the Rogue Fleece Hoody. The piece is packed with fisher-friendly features: tailored a little on the long side, sports ribbed cuffs and waist, full center-front zip, and Teflon-coated for superior water-repellence. 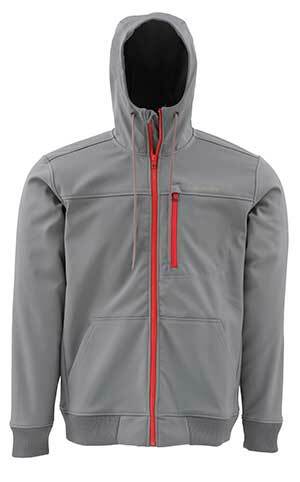 What I liked most about this hoody is that, unlike most fleece apparel, it isn’t bulky. The fleece is either pressed or shaved down, so it provides warmth, but can be rolled up and easily stored in a glove compartment. The hand warmer pockets are large, comfortable, fleece lined and open-ended – so car keys and fishing license will have to be stowed elsewhere. I tested the hoody in a heavy downpour and the outer fabric plus Teflon coating get top marks for doing what the manufacturer claims. The inside stays bone dry. My one complaint is that Simms made the exterior (zippered) fly-box pocket a touch too small. It would have been nice to be able to get a medium-sized box in there, but I suppose the pocket can be used for keys/fishing license instead. Casting/movement has been addressed with ergonomically tailored shoulder panels, sleeves and hood, which won’t blind you when you peek at your back cast. Nice! Available in charcoal or cammo. New for 2015. The “ultimate” all-round fly line, with ultra-low stretch performance. I’ll sum up this fly line in as few words as I can: it’s a no brainer. When RIO released its low-stretch Perception line last year, I immediately wondered why the same technology wasn’t applied to much of the remainder of their product range. 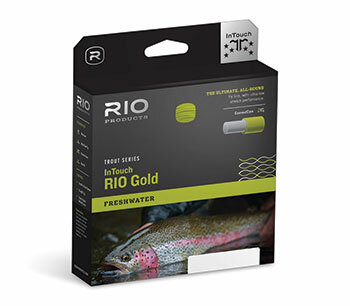 Turns out these things take a little time, but the issue has been addressed by the new InTouch RIO Gold. A word of caution: it’ll spoil you to the extent that you’ll wonder what to do with your other stretchy lines. Use it once, and become a fan, especially if trout are your main game. Built with a long head and rear taper, the line allows for solid loop stability while the weight distribution and front taper deliver pin-point presentations whether you’re fishing size #2 or #22 flies. Like its predecessor, it’ll take a few casts to acquaint yourself with this low-stretch product: precise cast timing is necessary, but the payoff is a surprising level of sensitivity, to the extent that even your line hand will revise its expectations – and in a good way. Bonus: unlike its stretchy brethren, this line loses little energy during casting, so expect a real improvement in distance. Exact presentation, precise mends, sharp hook sets: check. 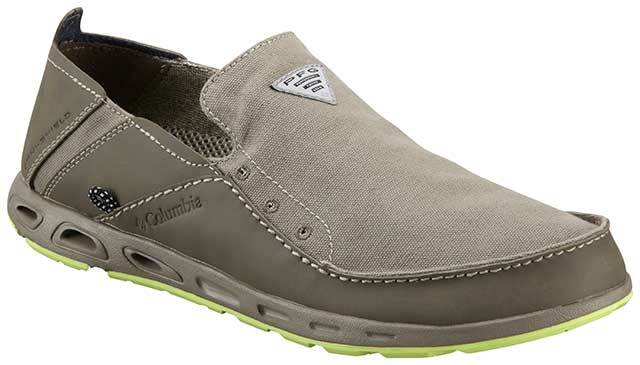 If you’re fishing the tropics, this is a versatile and ventilated slip-on that is designed for maximum air flow and encourages quick water evacuation (via drainable midsole ports), making it an ideal boat shoe. The Omni-Grip rubber outsole provides great traction on wet surfaces and the Techlite midsole cushioning equals all-day comfort. Bonus: the canvas/leather combination means they won’t look out of place at the marina lounge. If you have a preference for see-through fly boxes, check this out. Tacky Flybox just developed a product that uses a medium-hard, slit-silicone insert as the foundation for its see-through box. Unlike the usual dense foam used in many boxes, this material has near zero memory, which translates into extremely secure slots for your precious bugs. Currently available in one medium size that accommodates 168 flies(! 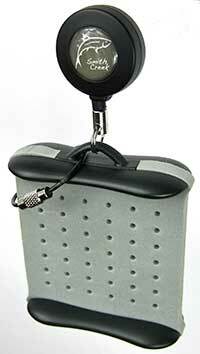 ), it features a shatter-proof polycarbonate lid and a magnetic closure. It packs very flat (only ¾”) so it will slip comfortably into your pockets. 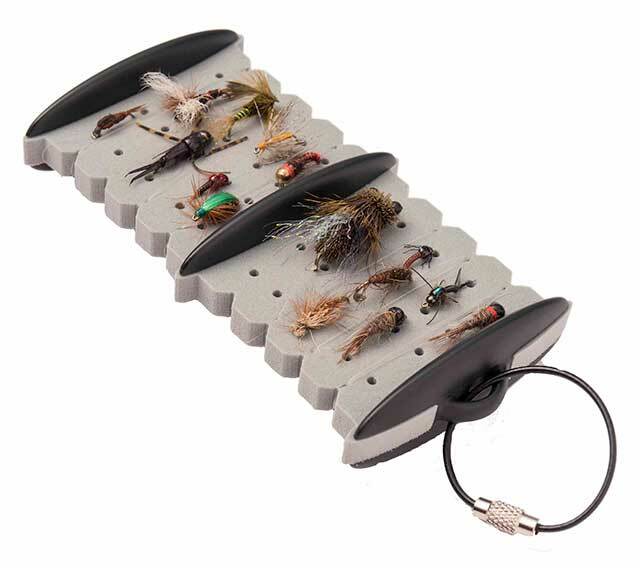 An excellent box for your small-to-medium sized flies. Good-quality gear greatly reduces the number of possible headaches on the water (ever have a cheap knife blade snap in the middle of a task?). Nippers, pliers and knife are the trio that must be up to task: you’re only punishing yourself by cheaping out on these essentials. So, been lusting for top-tier fishing pliers but don’t want to drop three figures? 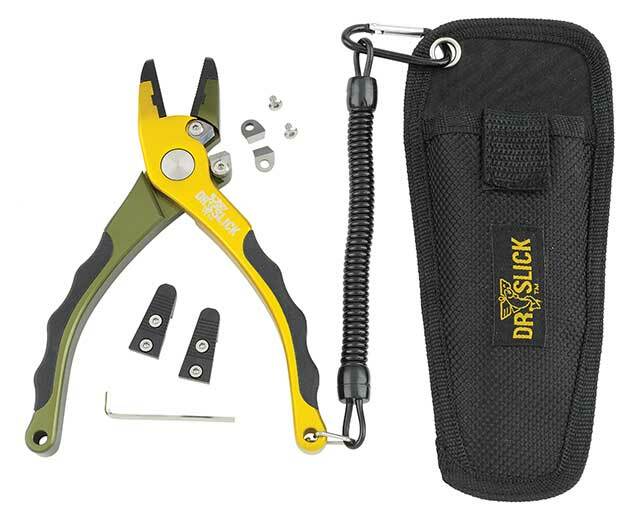 Dr. Slick’s Typhoon fishing pliers are the solution. This plier offers the full list of goods: fully machined and spring-loaded with integrated heavy duty cutters. Non-slip hard rubber grips that feel good in hand. Duo-colored anodizing means you can easily pick them out of grass or water after they’ve been laid (or fallen) down. Jaws are part smooth, part striated to aid delicate operations like knocking down a tiny barb, yet they are still capable of handling big tasks like extracting large hooks. Quite light at 4.5 ounces, and finally, the $60 tag is a no-brainer. Still not happy? Dr. Slick throws in a holster, lanyard, as well as an extra set of cutters/jaws, and a hex key to install them with – at no additional charge. Unreal deal. New Zealand-based Smith Creek released two new products: the Middle Fork Fly Patch and the Rig Keeper. Smith Creek states that each item is ergonomic and practical – they are – but the best feature is that these items will save you time on the water. How many precious minutes did you waste knotting up dropper rigs on that last trip? Smith Creek’s answer: do that work the evening before to your trip. The Rig keeper allows you to prepare and neatly stow 8 rigs. No more time wasted rigging on the water and best of all, no time spent untangling rigs: you simply (and neatly) wrap each rig onto the patch, ready at a moment’s notice. The Middle Fork Fly-Patch employs a custom micro slit foam and protects flies from damage or loss by its exposed ribs (same for the Rig Keeper) no more fly loss due to rub-offs and no more looking down at your vest or lanyard patch to discover that your favorite fly is gone. Smith Creek’s founder and designer Wayne Smith mentions that the guides and field-testers refuse to return the prototypes! A great sign. Load it up in the morning and leave your fly boxes behind. The Griptilian is a compact, folding, drop-point blade that features a heavily textured handle. The result? Zero slippage, even with wet hands. Ambidextrous thumb-stud opener for one-handed use in case of emergencies. Top-tier stainless steel blade coupled with no-frills functionality. I used a Griptilian for several months, attacking mono, wood and hard plastic cutting boards, and the blade remained just-out-of-the-box sharp. One of the toughest light-weights around. 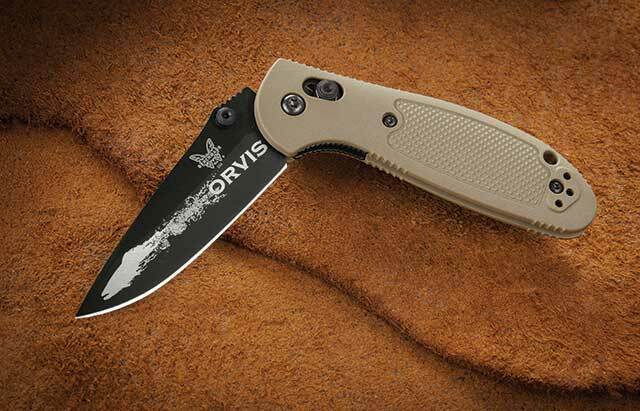 Compact 2.91″ blade length makes it a fishing essential.